A still from Robinson's short film "Leviathan," features a stunning rendering of a whale-like space monster that swims through clouds. A jaw-dropping short film featuring loating space monsters swimming through clouds on an alien planet is coming to a theatre near you: the "Leviathan" science fiction project has been greenlit to become a feature film. 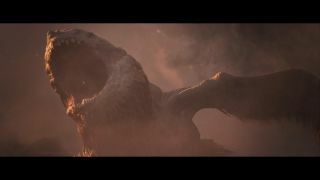 Ruairi Robinson, director of "Last Days on Mars," created a three and a half minute proof of concept trailer for "Leviathan" (embedded below), which shows a crew of futuristic monster hunters tracking down a whalelike creature that swims through an ocean of clouds. While it features no speaking parts, the featurette packs an incredible amount of drama, and the special effects are on par with a major movie production. Deadline.com reports that an impressive team of people is now involved in making the trailer into a feature film. Simon Kinberg, the writer and producer of two "X-Men" movies and a creative consultant on "Star Wars: The Force Awakens," will work as a producer on the "Leviathan" movie. The director of 2015's "Chappie," Neill Blomkamp, will be an executive producer on the film, and Jim Uhls, who wrote the script for "Fight Club" and is credited in the proof of concept trailer, will write the screenplay. The teaser trailer is prefaced with text explaining the premise of the story, which takes place in the early 22nd century, when humankind has achieved faster than light travel using an exotic material found in the eggs of the largest species ever discovered. As the short film so clearly demonstrates, hunting these eggs is a dangerous occupation, and most people who do it are "involuntary labor." Robinson has posted some incredible concept art and sculptures of the space whales online. The full movie likely won't be out for at least a few more years, and we'll be waiting anxiously for that date.